WORLDWIDE: Recent project updates from offshore projects in Germany, the UK, China and the US. Vessel charter: Seaway Heavy Lifting has been contracted by Trianel Windkraftwerk Borkum II to install its project's foundations. Foundations deal: Lamprell has been contraced to fabricate 60 steel foundation jackets for East Anglia One. Preparation work: Pre-construction works for East Anglia One are due to commence in January, with work starting along the 37km onshore cable route. Iberdrola Engineering & Construction has been appointed to undertake engineering design and is the Principle Contractor for the pre-construction and construction works. Turbine delivery: Adwen's 5MW turbine sets comprising nacelles, tower segments and rotor blades are being delivered to Sassnitz, the base port for Wikinger's construction. Transmission servicing: UK-firm RES has been awarded a five year contract to provide O&M services to offshore transmission assets owned by Blue Transmission. Cable installation: DeepOcean has been contracted to transport and install some of the inter-array cables for Dong Energy's 1.2GW Hornsea Project One. Port lease: Vattenfall, the developer of the European Offshore Wind Deployment Centre (EOWDC), has signed leases totalling 24 years with Aberdeen Harbour Board. 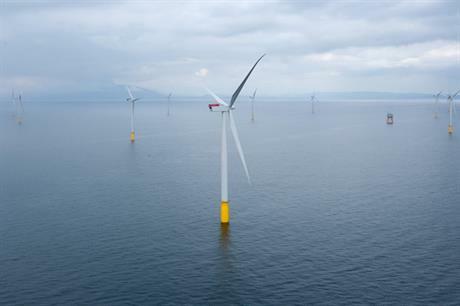 Base office: EDF Energy Renewables has opened a project office in Blyth, Northumberland, from where it will manage the construction of its 41.5MW offshore wind demonstration project. Monopiles installed: Offshore construction at Race Bank is proceeding ahead of schedule. All 91 monopiles have been installed, as has the first offshore substation. All three sections of the first offshore export cable have also been laid and before the end of the year, connection to the onshore cable will be made.